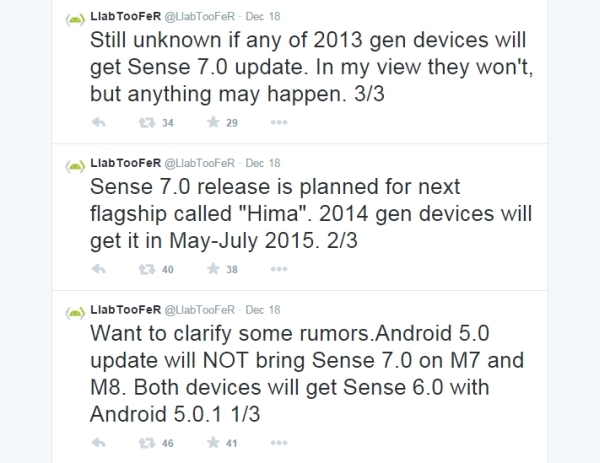 Android developer @LlabTooFeR said on Twitter that the Android 5.0 update for the HTC One M8 and M7 won't bring Sense 7.0. Both phones will still have essentially the same Sense 6 as on the KitKat ROM. The Sense 7.0 update is said to arrive first on the upcoming HTC "Hima" flagship arriving early next year. The 2014 gen devices are said to get the 7.0 update by the middle of next year, around May or June. He wasn't sure whether the 2013 gen devices will get the Sense 7.0 update.